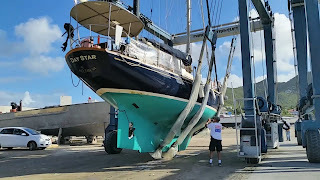 One of the things we did in St. Martin was to repaint Daystar's bottom. Our bottom paint, which prevents barnacle and algae growth on the hull, needed to be replaced. We can't paint the hull while it's in the water of course, so we needed to haul Daystar out onto land. And of course, a boat can’t just be placed straight down on its skinny keel. To take a boat out of the water and support it on land is a difficult and dangerous but relatively common process. Pictured above is a Travel Lift, the power behind lifting a sailboat. Slings hang down on each side. 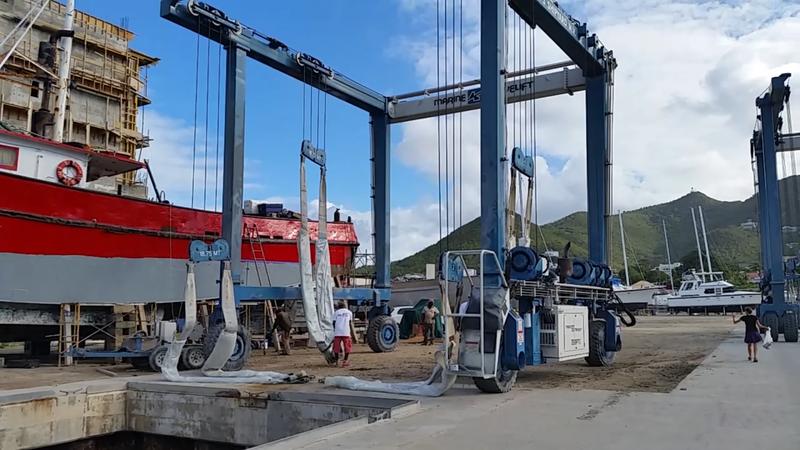 The Travel Lift is designed so that it can drive over the slipway where the boat is situated and lower the slings into the water under the boat. 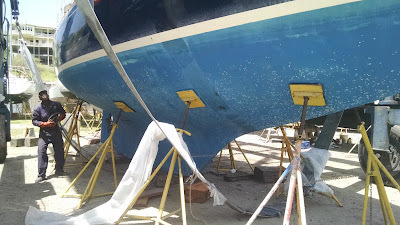 The slings are adjusted and then tightened so they are snug under the hull. Then (as boat owner tenses) the boat is lifted out of the water by raising the slings. The Travel Lift then slowly moves the boat into a spot on land where it will be supported. There are many tripod-like stands with big pads on the top that are placed in various spots under the hull so that the boat can be supported without the Travel Lift. The jackstands must be placed in the correct position so that the boat remains upright. All in all, it's a relatively simple process, but that doesn't mean it doesn't take skill. 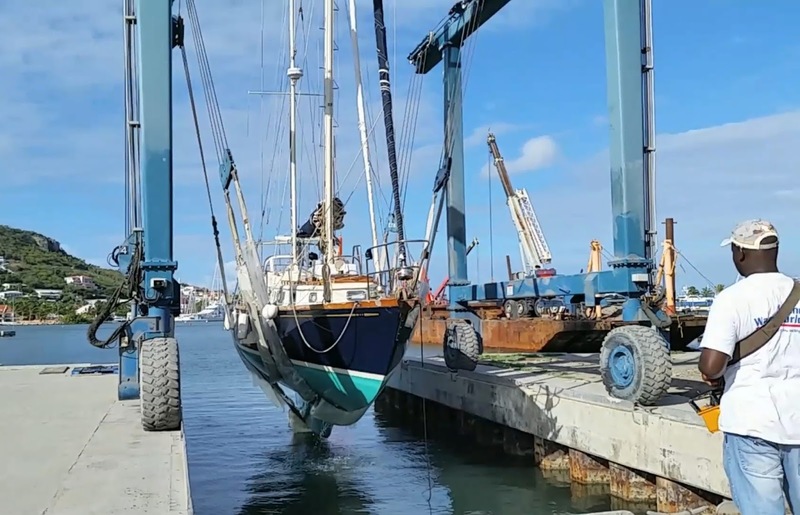 If the slings are off balance or adjusted incorrectly the boat could slide forward or back. If the jackstands aren't positioned properly the boat could fall over. So it's important to choose a boatyard that you trust to do the work correctly. When we were in Luperon, Dominican Republic, some friends of ours told us their story of hauling their boat out in the shabby, understaffed marina there. The marina had no Travel Lift, so they had to make do with other vehicles. They backed a flatbed trailer into the water under the boat and attached stands to the flatbed to support the boat. They hauled the boat out using a tractor attached to the flatbed. They got the work done, but when the boat was ready to go back in the water the tractor was being used at a different job. They waited and waited, but the tractor was not released. Eventually the marina had to hire a dump-truck to back the boat into the water instead.